“Crudo di Parma” and San Daniele are both genuine and natural foods, moreover they are known all over the world. The similarities at the level of production are many: in fact both salumi are made only with legs of Italian pigs, sea salt and a completely natural maturing. 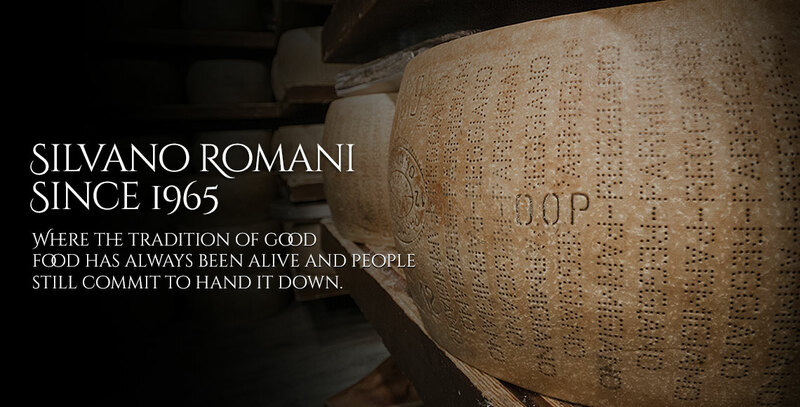 Moreover, both salumi are protected by PDO marks and by the relative Consortiums. 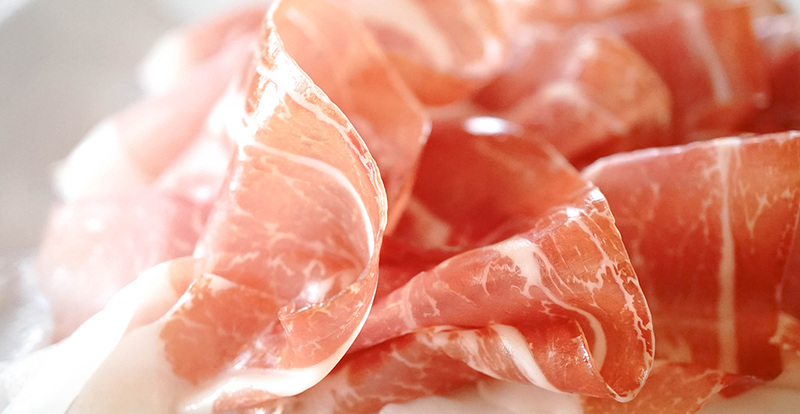 The area of production of Parma Ham involves all the area of Parma, while San Daniele is exclusively produced in the municipality of San Daniele in the province of Udine, an hilly territory in the Northeast of Italy. It follows that there exits a big difference of productivity: while the participants of Consortium San Daniele are 31 today, those of Consortium of Parma Ham are 150. During a year San Daniele is characterized by a production of approximately 2 millions and 650.000 Hams, while "Crudo di Parma" Ham approximately 9 millions. San Daniele is recognizable because of its typical guitar form and because of the presence of the pig's foot, while Parma Ham has a round form. Moreover, the brand of San Daniele is a stylised leg with the pig's foot, while the brand of Parma Ham is the famous Ducal Crown. Both Hams are characterised by a restrained savourness, which shades into its typical sweetness; San Daniele has already complex scents and aroma after a maturing of 18-20 months, while Parma Ham reaches this development more slowly, around the 24 months. "Crudo di Parma" Ham is perfect in combination with melon. 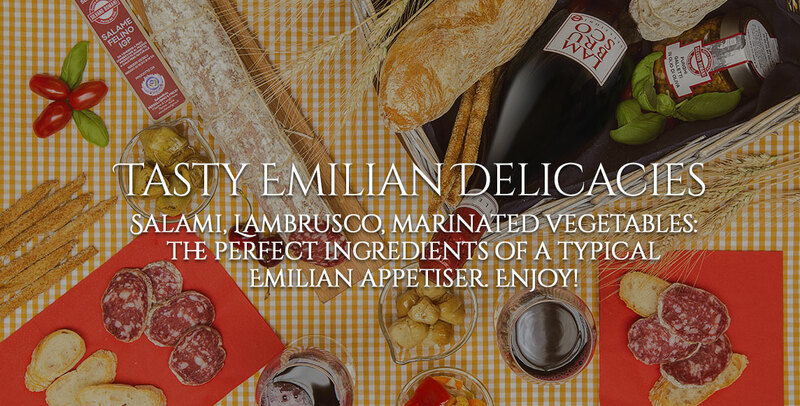 Moreover, you have to try it with fresh cheeses, such as mozzarella and burrata, or simply with breadsticks. In addition, it is an inevitable ingredient for tortellini. Instead Ham San Daniele is excellent with focaccia and fits well also with sweet fruits, such as melon, figs, pears, grapes or pineapple. Jamón Serrano is the typical Spanish Ham. There are two main varieties of Jamón: Iberian Jamón and Serrano Jamón. The Iberian Jamón has a peculiar flavour because it is obtained from black pigs, which are bred in the wild and fed with oak’s acorn, while Jamón Serrano derives from a less pure Iberian race mainly fed with cereals animal feeds. The maturing of Jamón Serrano goes from 7 to 24 months and its meat is lighter than the meat of Iberian Ham that isn't much bright. Jamón Serrano fits well with drinks that increase the flavour of Ham and accompany it without covering its flavour, such as red young wines. A clear difference compared to Parma Ham is the cut. Indeed being able to cut Jamón is a competence that requires practice and skill of the "cortador", that is to say the carver. Essential for this activity are a support for Ham, a knife with a wide blade, a specific knife for Ham and a knife to bone in order to work the product in the most complicated areas. The Iberian Jamón is characterised by three essentil factors: the pure race of Iberian pig, the semi free life of the animal and a nutrition based exclusively on acorns (in Spanish "bellota"). In fact the complete name is Jamón Iberico de Bellota, known as Pata Negra too. The name Pata Negra derives from the variety of pigs whit which it is produced, pigs of Iberian black-coated race and with the typical black nail of the hoof. The flavour is mainly influenced by the nutrition based on oak’s acorns and by the movement that the animal made in the wild. The oak’s acorns are rich of oleic acid, a substance, which is rich of extra virgin olive oil. Also this element is in the grease of Ham, which is rich of “good” cholesterol. The maturing of Iberian “Bellota” goes from 24 to 36 months. The meat of Iberian Jamón is intense red, characterised by a scent of field's herbs. Its grease is particularly savoury and intense, above all when it melts at the temperature of 32-33°. The best way to consume Pata Negra is to cut it by hand, in thin slices. Norcia Ham derives from the namesake of the city of Norcia in Umbria, from always known and appreciated for its salumi. Moreover, the term "norcino" is widespread in order to indicate who works the pork meat. The production is similar to the production of others Hams, with two salting, 2 months and a half of resting, “sugnatura” and a minimum maturing of 12 months. Unlike the Parma Ham, the tradition of Norcia Ham PGI wants that it is sliced by hand, in a thin manner, in order to enhance the properties. It can be consumed with figs and melon, or with typical cheeses. Moreover you can drink slightly wavy red wines or light rosati. Another Friulian excellence is Sauris Ham PGI, which is exclusively produced in the municipality of Sauris. Sauris Ham is a salty Ham Crudo, characterised by a sweetness and a slightly smoked taste. The product has been subjected to a particular light smoking, which is made of beech and juniper woods extracts or other typical resinous extracts of Canic Alps. This salume has to mature in distinctive spaces, which have little windows for the product’s ventilation, for at least 12 months. It is a soft and delicate Ham, enriched by a shade of smoked, which particularly diversifies this salume in its flavour from "Crudo di Parma" Ham. Moreover, it fits well with a white wine of medium body, sparkling too, for example with the same wines, which are produced in Friuli Venezia Giulia. In cooking it is a very versatile product, suitable for the creation of many starters and first tasty courses. "Prosciutto Crudo" of Faeto is the result of a typical traditional production of the Faeto mountains. Faeto is a little mountain municipality, the highest in the province of Foggia that is characterised by thick woods of beeches and a pure and dry air which make possible the breeding of pigs in the wild and the natural maturing of meats. It is a product, which is unique in its kind, above all the taste given to the black pig meat by a nutrition based on berries, acorns and corn. Faeto Ham is recognised by the Apulia region as A.T.P. (agricultural and food traditional products) and protected by the Association for the promotion of Faeto Ham. Furthermore, it is a savoury Ham, whose meats are of brick red colour and have rosy lard. Parma Ham or "Prosciutto di Montagna"
Its complete name is Venetian Berico-Euganeo Ham because it is produced in the province of Parma. Its full and sweet flavour, its rosy colouring at the moment of the cut are features which derives from a perfect balance of the choice of raw materials, the periods of salting, weight of Ham, duration and conditions of maturing. For this reason, it is called "dolze" Crudo di Montagna. In addition Ham Crudo di Montagnana can be branded with the Lion of Saint Marco and the writing "Veneto" not before reaching 12 months of maturing. For its softness and its delicate scent, it fits well with the preparation of starters, first and second courses of high gastronomy level. Cuneo Ham is a PDO excellence of Piedmont, protected by the Consortium of Protection and Promotion of "Prosciutto Crudo di Cuneo". 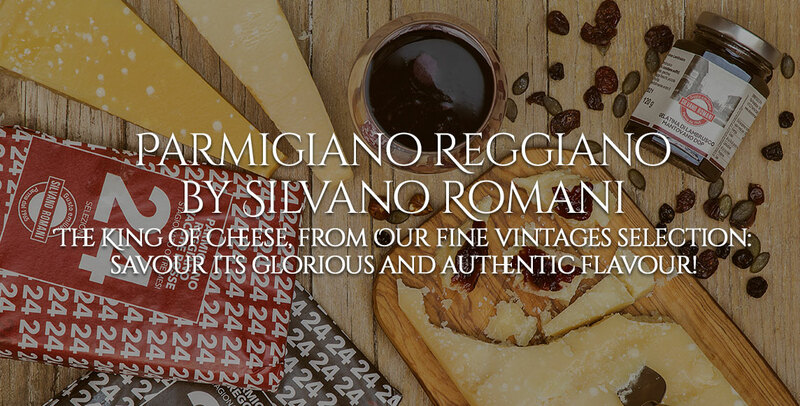 Its flavour is delicate, it tends to the sweetness, with a soft and buttery compactness. Furthermore, it fits well with melon and figs and it is excellent in combination with local wines, for example Timorasso.